The last time I shared an old photograph of an unidentified Woolworths store, Soult’s Retail View readers were quick to identify it as the original Woolies on Aberdeen’s Union Street (store #228) – a store that closed in 1990 but whose former premises still survive. This latest teaser is a bit more of a challenge. 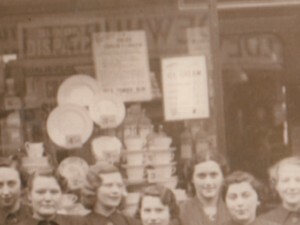 I recently bought the postcard above on eBay, as it depicts an unidentified Woolworths shopfront – and its proud staff – in fantastic detail (click on the image to enlarge). However, there’s no indication of which store the photograph is of, and the focus on its attractive shopfront – which was typical of the period for Woolworths – means that there are few specific architectural clues. There are, nevertheless, a few tantalising fragments that provide a starting point for my inquisitive research skills! Rather helpfully, the postcard has a date – ‘April 2nd 1938’, which was a Saturday – written in pencil on the reverse side. 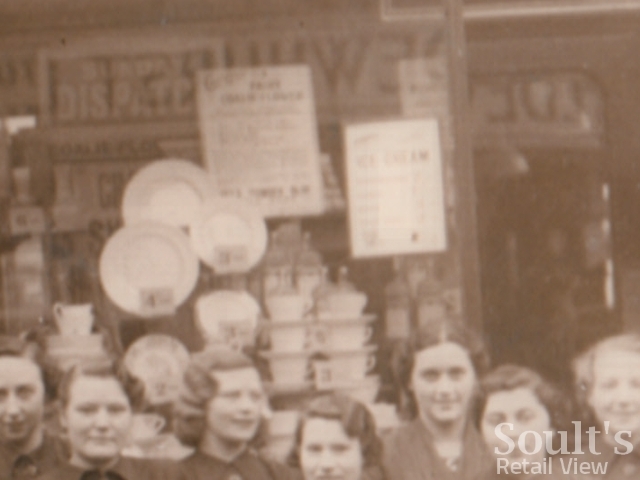 Given that the store was advertising ‘Easter Eggs and Gifts’ at the time of the photograph, there’s every reason to think that the date refers to when the photograph was taken. A quick check confirms that Easter Sunday in 1938 was on 17 April, which would fit with this timing. Full-group photos of Woolies staff such as this were often published in The New Bond, Woolworths’ regular staff magazine at the time, so it makes sense to look through the 1938 issues to see whether the photograph appears. 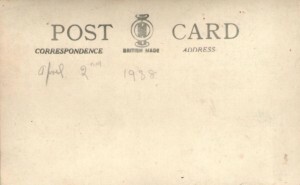 Unfortunately, however, I couldn’t spot it in any of the issues from April to December 1938 – the period during which it might conceivably have been used. 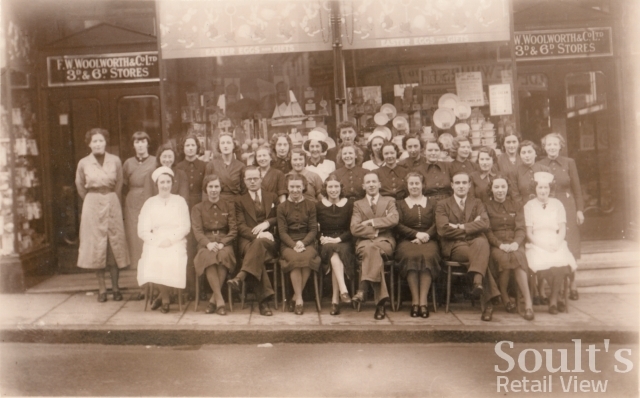 Another line of enquiry prompted by the date is to see which stores launched at about that time, as group shots like this were sometimes taken to mark a new store opening. The new Woolworths in Gosforth (#716), for example, had opened just the day before, while the original store in Sherborne (#714) – as opposed to the later, relocated store that I recently blogged about – had opened its doors on 24 March. In contrast, the opening of store #715, in Tenby, wasn’t until a little later, on 8 April, reflecting the fact that the allocation of store numbers didn’t always correspond exactly to the actual order of opening. Could the mystery store be one of these newcomers? Well, yes and no. Look closely at the photograph above, and you can see that there are steps up to the right-hand entrance but not the one on the left. From this, we can assume that the street is sloping, which would fit with Sherborne’s Cheap Street but rule out many other Woolworths locations – including Gosforth – where the street is on the level. Look again at the top image and you can see how it has been taken in a way that makes the staff – who are the main subject of the shot – appear to be on the horizontal. The flipside of this, of course, is that the building now has a slightly curious upwards tilt. My adjusted shot below would therefore be a more accurate view from the street, emphasing its gradient, but you can see how it creates a less pleasing composition as far as the group photo is concerned, with the angle of the pavement drawing the eye to the bottom-right corner. Clearly the photographer knew exactly what he or she was doing! The quality of the image also means that quite a lot of detail is visible. There is some kind of poster, for example, referring to the Sunday Dispatch; it was a national newspaper, however, so doesn’t help us to pinpoint a location. More useful is the Dewhurst shop opposite – presumably a branch of the famous butcher’s chain – which can be seen reflected in the shop window. Moreover, there’s some suggestion from the photograph that the Dewhurst shop may have been on a corner site, though distortions make the exact configuration difficult to work out. Finally, looking at the reflection and the size of the Dewhurst lettering, we can probably assume that the street is relatively narrow, as a wider street would give us a broader but less detailed reflection of the buildings opposite. The final clue is the size of the staff group, which is 30-strong. 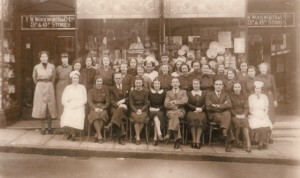 Compared, for example, to a group photo of the Sunderland Woolies staff in the July 1938 New Bond – which features about 90 staff members – our mystery store is clearly much smaller. On the other hand, the group is rather larger than the 16-strong team from Stalybridge (#578), pictured in the May 1938 issue of The New Bond. So, it suggests that the store in question is neither a very large one nor among Woolworths’ smallest at the time. So, in summary, we have a medium-sized Woolworths store, located on a narrow and sloping street opposite a branch of Dewhurst, for which 1938 may or may not be a significant year. 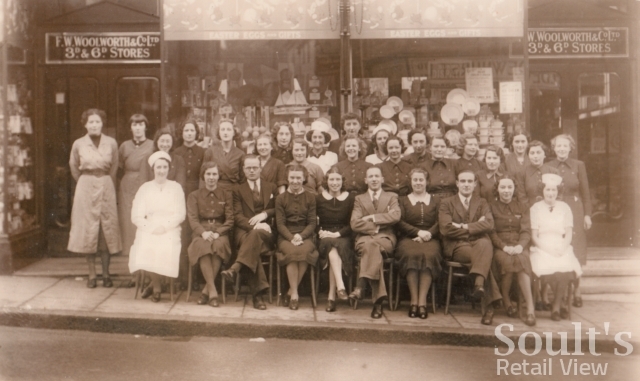 I’ve given you the clues – can you now help identify the mystery store? The shop on the right in the photo of Cheap Street, Sherborne at http://www.francisfrith.com/sherborne,dorset/photos/cheap-street-c1955_s112091/ looks as if it might be the original Woolworth’s (now Edinburgh Woollen Mill judging by Streetview). Not sure if this is the one in the photo – perhaps someone else can judge this better? If it was then Dewhurst would seem to have moved on by the time of the Frith photo and the shopfront opposite could easily have been replaced in the intervening years, so wouldn’t have to match perfectly. That’s excellent, Tom! If nothing else, you’ve helpfully identified the location of Sherborne’s original Woolies, which was a question raised in the earlier blog. As far as Sherborne possibly being the mystery location is concerned, the slope of the street looks about right and the building opposite does have a ‘corner’ of sorts – so, it’s definitely still a contender, I would say!